This comprehensive tour includes all the principal attractions of Grand Cayman. It is also an opportunity to familiarise with its typical inhabitants: turtles! And to conclude there is a regenerating stop where we can savour the typical rum cake. A moment of absolute fun as we discover the colours and traditions of Grand Cayman! Our journey begins with a brief panoramic tour of the city of Georgetown*_._We pass in front of Fort George, the Legislative Assembly Building, Heroes Square, the Peace Memorial and the many banks which have made Grand Cayman famous. But our tour still has some surprises in store for us: indeed a mythical journey to Hell awaits us! We drive along the road which runs alongside the famous Seven Miles Beach, while the guide points out the major points of interest on the way. We then come to the area where all the major hotels are located; along the way we see the house of the Governor of Grand Cayman and the oldest house on the island. Half way along our journey, a natural expanse appears before us, a limestone formation with bizarre jagged pinnacles that look like flames: we are in "Hell", where we have to be careful not to fall victim to Satan who tries to bribe us with all sorts of souvenirs. Do not forget to send a postcard with a postmark from Hell! 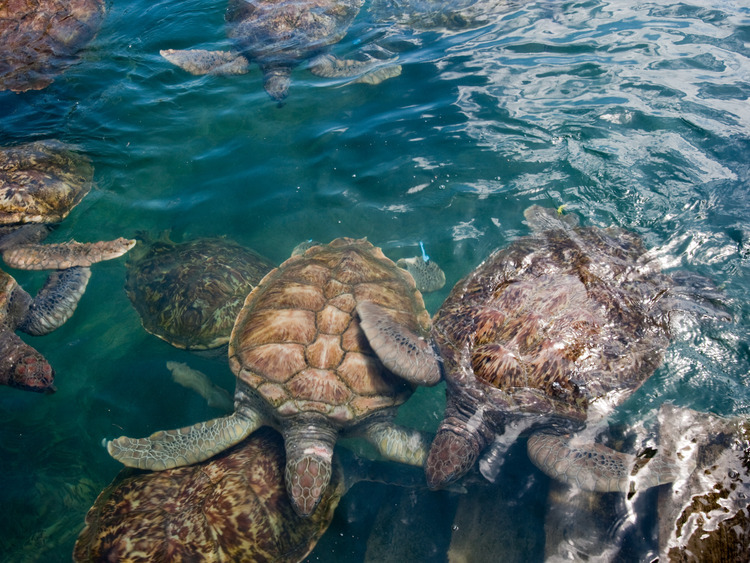 At the Turtle Farm (Boatswain's Beach) we can admire the famous Green Sea turtles which can weigh more than 200 kg. Here we can actually touch them and see them close up. There are also other species of turtle such as the Cassidy, Kemp's Ridley, Loggerhead and Hawksbill turtles. Needless to say, an excursion would not be complete without a moment for refreshments, and here we are in the right place for rum cakes, a typical Caribbean speciality that we can savour before returning to the city centre. The vehicle driver provides the excursion guide in English. Before setting off on the excursion, participants will be asked to fill in a release form in English.